Samsung Galaxy S5 Mini is out for quite a while now. We are getting to see some custom stuff for this device coming out on the developer forums now and there are very good chances that we will be having a lot of custom ROMs, custom MODs and other tweaks to test the actual power of our beloved device in the coming few days. For the folks who do not have an idea about the Galaxy S5 Mini, the Galaxy S5 Mini is Samsung’s 3rd device in the mini series and the younger sibling of the Galaxy S5. Samsung pulled the curtains off from this device after the Galaxy S5. On the front we have a 4.5 inch Super AMOLED display having 326 ppi. 8 MP camera shooter is fixed at the back, 2.1 MP shooter can be found on the front. Galaxy S5 Mini does have a fingerpring scanner, and the device is water proof as well. Samsung equipped it with Exynos 3470 CPU and a RAM of 1.5 GB is fixed inside as well. Originally, the Galaxy S5 Mini runs on Android 4.4.2 out of the box. There hasn’t been any further update out for this device yet, but just as we talked about the custom stuff in the start, there will be much stuff to play with on your device soon. But to load all that and to play with your device being safe and secure, you will need a custom recovery that will allow you to backup your current system, backup your efs partition and load any custom stuff on your device by flashing zip files. While TWRP recovery serves this purpose very well, XDA recongized contributor rutvikrvr brought it up for the users. At the moment, this is the only custom recovery available for the Galaxy S5 Mini and currently, the recovery is in its beta stage and is found to be working find on the SM-G800F variant of the Galaxy S5 Mini. 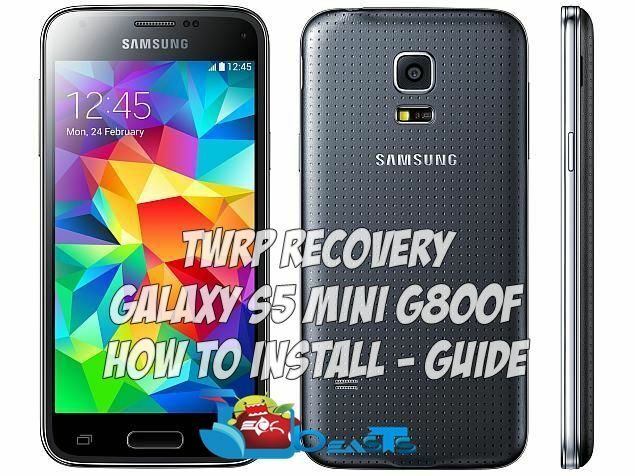 As you move forward, you will come across a complete guide to install this TWRP recovery on your Galaxy S5 Mini SM-G800F. Just in case you’ve been looking for it, you may go ahead and flash it using the instructions explained below. Make sure that your device is exactly as mentioned above. To check out what device you have, go to Settings > More/General > About Device or Settings > About Device and match the model number. Be careful about the device model number, flashing a file on a device not listed here might result in bricking it up. In that case, we may not be held responsible. 2. Battery should be charged at least 60%! Your device’s battery shouldn’t be weak. In case your device goes dead during the flashing process, your device may get soft bricked and you might be in need of flashing stock firmware and that will ultimately result in wiping up your data as well. So, make sure that you charge your device before you start the flashing process. USB debugging mode should enabled on your device in order to avoid any connection issues. To enable USB debugging mode, go to settings > developer options > check “Allow/Enable USB Debugging”. In case you can’t find the developer options in settings, you will have to activate the options by going into settings > about device > tap the build number for 7 times and you should get the developer options under settings, and then you can enable USB debugging mode. 4. Use the OEM datacable to establish connection! Always use the original data cable to establish connection between your Android device and your computer / laptop. Using ordinary data cables might interrupt the flashing process, so to avoid any mishap, you need to meet this requirement as well. 6. Turn off Samsung Kies and other softwares while using Odin3! Make sure that you turn off Samsung Kies while using Odin3 flashtool. Samsung Kies will interrupt Odin3 and will result in causing errors and may not let you flash your desired recovery or root file. Also, make sure that you turn off any antivirus software you’ve installed and also disable firewall to avoid any connection and flashing issues. The methods involved in flashing custom recoveries, ROMs and rooting your phone are highly custom and may result in bricking your device, and has nothing to do with Google or the device manufacturer that is SAMSUNG in our case. Also rooting your device will void its warranty and you will be no longer eligible for any kind of free device services by the manufacturers/warranty providers. The Galaxy Note 4 comes with Knox, so rooting will also trip the Knox counter and you won’t be eligible to claim the warranty anyway. In case of any mishap we may not be held responsible. Follow these instructions to the letter to avoid any mishap or bricking. Make sure that whatever you do, you are doing it at your own responsibility. Download and extract Odin3 v3.09. Download latest build of TWRP Recovery.tar | TWRP Recovery 3.0.0 for G800F/M/Y file. Note: The recovery linked here will also work for G800M and G800Y. Put your Galaxy S5 Mini in download mode. To do so, turn it off and wait for 10 seconds. Turn it on by pressing and holding Volume Down + Home Button + Power Key simultaneously, You should see a warning, press Volume Up to continue. In case this method doesn’t work for you, try one from this guide. As soon as Odin detects your phone, the ID:COM box should turn blue. Make sure that you’ve installed Samsung USB drivers before connecting. For Odin 3.09 hit the AP tab. Select the recovery.tar.md5 or recovery.tar, that you downloaded above. If you’re using Odin 3.07, you will select “PDA” tab instead of the AP tab, rest of the options remain untouched. Make sure that the options selected in your Odin are exactly as shown in the pic. Hit start and wait till the recovery flashing is complete, as soon as your device restarts, remove it from PC. You can now boot into recovery mode by turning off your device, and then turning it on by pressing and holding Volume Up + Home + Power Key. Although there’s a much easy method available to root your Galaxy S5 Mini, that can be found here. But, in case you haven’t rooted yet and you’ve flashed the recovery only, you would like to have the root access too, here’s a way to root your device using the custom recovery. Copy the downloaded Root Package.zip file to your Galaxy S5 Mini’s SD card. Boot into recovery mode on your Galaxy S5 Mini, use step 11 in the recovery installation guide. Now Select “Install > Choose Zip from SD card > Root Package.zip > Yes / Confirm”. 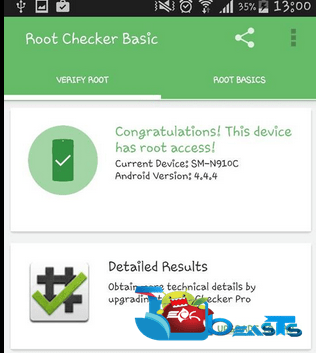 This will flash the Root Package and quickly gain the root access on your Galaxy S5 Mini. To do so, go to Google Play Store on your Galaxy S5 Mini. Find “Root Checker” and install it. It will ask you for SuperSu rights, tap “Grant”. It should show you Root Access Verified Now! You may want to create EFS and Nandroid Backup now. That’s all. We hope that you found this guide helpful. If you’re stuck with anything or got any queries, make sure that you use the comment box below and reach us. Thank you all.